By	Jake Redman	• 6 years ago	• Videos, Lounges: USA, JFK- New York JFK Intl. Seating: The mix of seating at JFK Terminal 4 Delta SkyClub has the usual mod furniture found in many of the airlines updated lounges. Tall side-and-back cube chairs best used for avoiding conversations with other guests, small but comfortable swivel chairs, and even deep leather recliners in a separate quiet-area for the extreme lounger. But what really makes this lounge better than most in Delta’s network is the separation of seating into different areas. 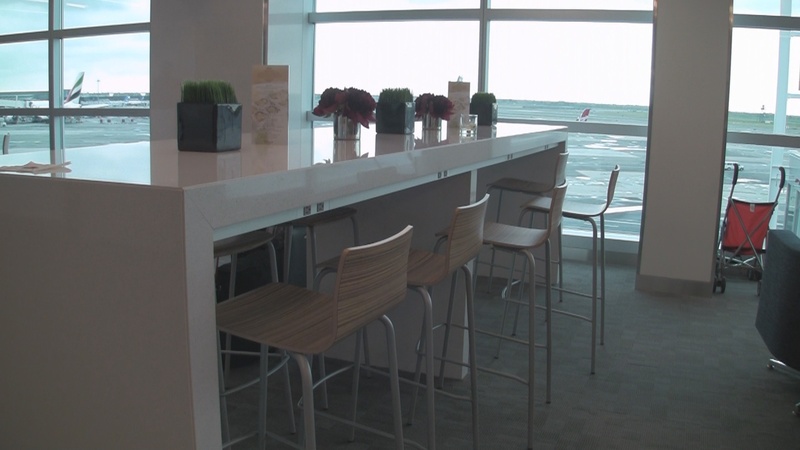 Unlike their LaGuardia or other updated hub lounges, The JFK T4 SkyClub is nicely broken into different areas providing a sense of exclusivity in each uniquely designed area. For example, A room full of cafe style seating is separate from the more private tall-back chairs and areas like the outdoor skydeck, relaxation room and workstation area give guests more places to personalize their experience. Booze: That top-shelf liquor comes at a price is a point of contention among paying members, but is the new standard here. Delta’s “Luxury Bar” serves up mixed drinks with high-end brands like Ciroc (Vodka) and Avion (Tequila) and premium wine and beer (Heineken, Blue Moon, etc). Plugs line this communal bar-style table. Outlets are everywhere at this Delta Sky Club at JFK’s Terminal 4. Wi-fi/Connectivity: The Delta T4 Sky Club at JFK is clearly designed for our modern, battery-sucking doo-dads. Power outlets are just about everywhere you look from floor outlets to raised ports near tables and loungers. It’s tough to find a spot here where there’s NOT an outlet nearby. Wi-fi is complimentary for lounge guests. Service: Ours visit was on opening day so spirits were high and the company president was in the lounge so it’s not fair to even rate service this time. Smiles and top-notch service ruled the day. (I’ll be sure to update this review after my next visit). 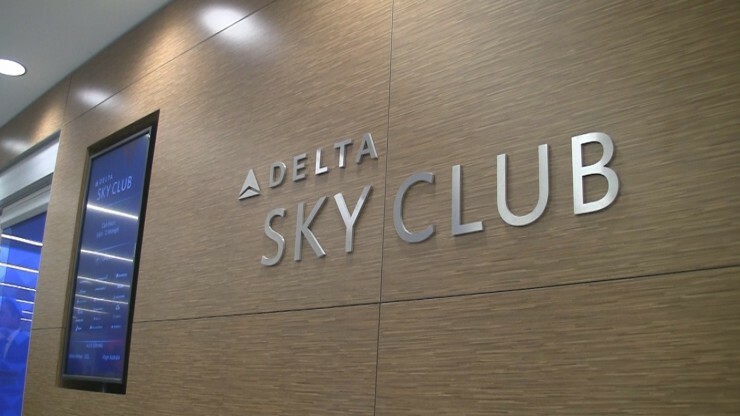 Summary: After being a little disappointed with the wide-open layout of Delta’s early ’10s Sky Club remodels, we’re impressed with how this lounge is broken into different spaces that let you better personalize the experience. Here, you’ll find plenty of ways to customize your visit from what you eat to how you relax or work. How to get in: If you’ve got a cluster of trips on Delta over a 30 day period, a 30 Day pass for $90 (9/1/2012) is a solid value if you use it for at least 4 individual visits over the 30 days or are travelling with friends or family (guests are permitted under the same rules as a full membership). Delta branded American Express cards are good for a single visit along with a $25 co-pay, a good option if you don’t make frequent use of Delta’s lounges. 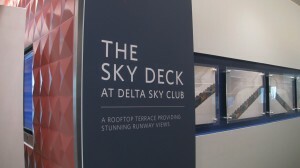 Delta Reserve card grants complimentary access when flying Delta. Avoid the Sushi in the lounge – fish is fine but rice is ice cold. Unacceptable. Thanks for the review. I like this club also. I was heading to Asia so a quick shower during my layover seemed to help. Very Nice Club.